NetherRealm Studios isn't finished with Injustice: Gods Among Us, and we should hear more on the game's upcoming downloadable content plans at the annual EVO fighting game tournament. Injustice: Gods Among Us, a fighting game based on DC Comics mythology and created by the people behind the most recent Mortal Kombat, has already received a ton of DLC. Four additional characters, new game modes and more bonus costumes than you could shake a batarang at have all been delivered to the title since its launch on April 3, 2013. Still, the game has been such a hit that NetherRealm head Ed Boon has long been teasing additional DLC beyond what had previously been announced as part of the game's Season Pass. It appears that this time Boon wasn't just messing with fans, and the company plans to offer full details at EVO 2013. As you can see, the official announcement of this EVO announcement doesn't arrive until tomorrow, but Boon couldn't contain himself. Thus, consider the above an announcement of an announcement of an announcement that may or may not contain anything you care about. Some days the games industry is almost too exciting. 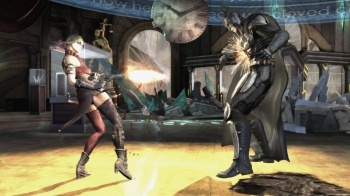 Since we don't really know what Boon et alia has planned for the future of Injustice DLC, now would be a good time for speculation. It's long been rumored/hinted at that Martian Manhunter would be the next character to join the game's roster, but we have no idea how many other characters, costumes, game modes or stages NetherRealm might have up its collective sleeves. For all we know the company is just going to churn out new STAR Labs missions until the heat death of the universe. Anyway, EVO 2013 is scheduled to take place in Las Vegas on July 12-14, so we won't have to wait long for more info. We'll bring you everything as soon as NetherRealm makes it public.